When November began, I stated my intent to use the #NaNoWriMo writeathon as A method to start writing my next novel, The War to Persevere: Book 2 of the Fundamentalists. One month later I have written 15,000 words or just under a third of what qualifies as a novel. 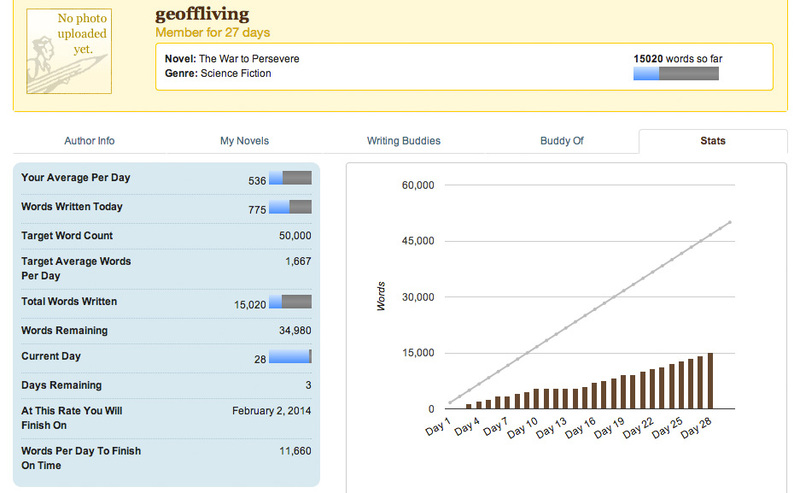 Generally, I met my goal for #NanoWriMo,, and wrote most days, 21 out of the 28 days, and 13 of the last 14. Six of those missed days were in the first half of the month, so I picked up momentum as time progressed. At the same time, I got lapped by many, many writers who delivered full novels this month. It was amazing to watch these tenacious writers complete their drafts. It was surely a grind for them as I could see by their daily updates. Meanwhile, I felt like a jogger slowly starting the marathon. By the time I completed one quarter of the race, people were close to finishing. Oh well. Life running a business and fathering a toddler precludes writing a novel in a month. We’ll have to settle for the slow slog, and finish at some point this winter. It does feel like the book may come in a little short, perhaps at 40,000 words, give or take, which makes it either a novella or a short novel. We’ll see. The 5.56x45mm NATO round plays a prominent role in The War to Persevere. Not quite as noble as Exodus‘s Emerson quote, but absolutely as defining for what is to come. A great struggle begins, one that will demand changes for our heroes if they are to survive. It’s quite fun writing the book! I’m glad I had the opportunity to work on it just as the holidays were arriving. We’ll see where we end up as the year ends.